20 buildings, 80 residential units. reception. parking lot. fee payable: bakery service, convenience store, washing machine. comfortably and tastefully furnished. across 2 floors. shower, toilet. guest toilet. satellite TV, radio, CD player, wireless LAN. gas heating. terrace. outdoor furniture, electric grill. parking space. terraced house. living / dining room. bedroom on the upper floor, 1 double bed.bedroom on the upper floor, 1 double bed. 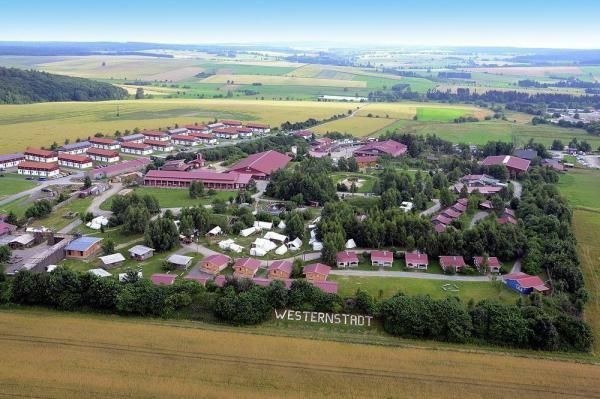 shopping 2 km, bar 200 m, restaurant 200 m, bathing 4 km, river Hassel 1.3 km, train station Blankenburg 12 km, location Braunlage 22 km, location Quedlinburg 30 km. In winter, bookable at/on : DMG03538. playground. fee payable: 2 baby cribs (in addition to maximum occupancy), 2 highchairs, please reserve. sauna (fee payable). soccer field, table tennis, volleyball. bicycle rental (fee payable).